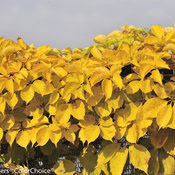 Yellow Wall Virginia Creeper is a North American native vine that is fast growing and salt tolerant. The Yellow Wall Parthenocissus has foliage that is yellow and green changing to all yellow for fall. As with other Virginia Creeper varieties, this creeping plant is a good choice for covering large areas such as hillsides, fencing, and trellising for privacy. It is an aggressive grower that can be pruned in summer for control. Tips for Virginia Creeper: The Yellow Wall Virginia Creeper blooms in fall on old wood. Caution: Do not plant to grow on houses or buildings as the vine may cause damage over time. Vines grow to about 20 to 30 feet long. Space 5 to 10 feet apart. Pair with the Red Wall Virginia Creeper for contrast. Save when purchasing the two as a combo. At this time this item is not available.